Dupont Circle is a cosmopolitan neighborhood with some of Washington, D.C.'s finest museums, historic homes and foreign embassies as well as a variety of ethnic restaurants, bookstores, and private art galleries. This neighborhood is the heart of Washington, D.C.’s nightlife. 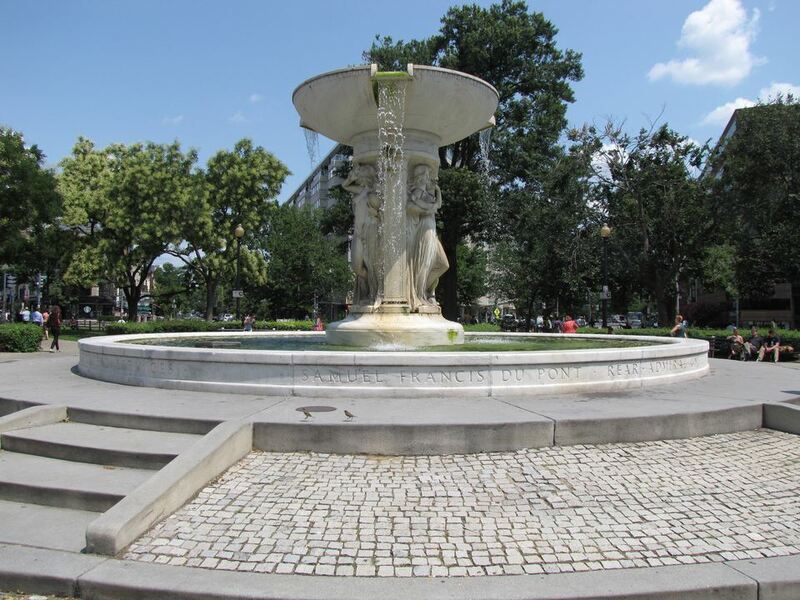 The Dupont Circle community is diverse and has a vibrant energy. There are lots of high-rise apartment buildings and many rowhouses have been converted into apartments. The Circle itself is a gathering place with park benches, grass and a unique fountain in the center. It is an interesting place to walk around and explore. See a photo gallery of Dupont Circle and the surrounding area. The Dupont Circle area is very busy and parking is limited. Public transportation is highly recommended. By Metro: The closest Metro station is Dupont Circle. See a guide to Using the Washington DC Metrorail. By Bike: Capital Bikeshare allows you to take a bike from one of over 180 stations in DC and Arlington, and return it to a nearby docking station. The closest docking stations are located two blocks away at Massachusetts Avenue & Dupont Circle, NW and 20th & O Street, NW. Museums Near Dupont Circle - The neighborhood is home to several small museums, including the Textile Museum, Woodrow Wilson House, the Phillips Collection, Brewmaster's Castle and many more. Embassy Row - The area extending along Massachusetts Avenue from Dupont Circle toward the National Cathedral is home to many of Washington's foreign embassies. The Cathedral of Saint Matthew the Apostle - The Cathedral church and parish is the seat of the Archbishop of Washington. As the Mother Church of the archdiocese, it plays a major role in the Catholic life of the nation’s capital. Brookings Institute - The nonprofit public policy organization is consistently ranked as the most influential think tank in the U.S. Brookings is nonpartisan and provides fact-based analysis for opinion leaders, decision makers, academics, and the media on a wide range of issues. Read more about Think Tanks. Dupont Circle is an eclectic neighborhood with a wide variety of restaurants ranging from fast food to unique ethnic eateries. See a guide to the best restaurants in Dupont Circle. The area is also one of the most popular destinations in the city for nightlife. See a guide to Dupont Circle Bars and Nightclubs. There are a variety of interesting places to stay in this popular neighborhood. See a guide to hotels in Dupont Circle. Learn about a variety of accommodations ranging from family-friendly hotels to cozy bed and breakfasts. A Neighborhood Guide to Chinatown in Washington, D.C.